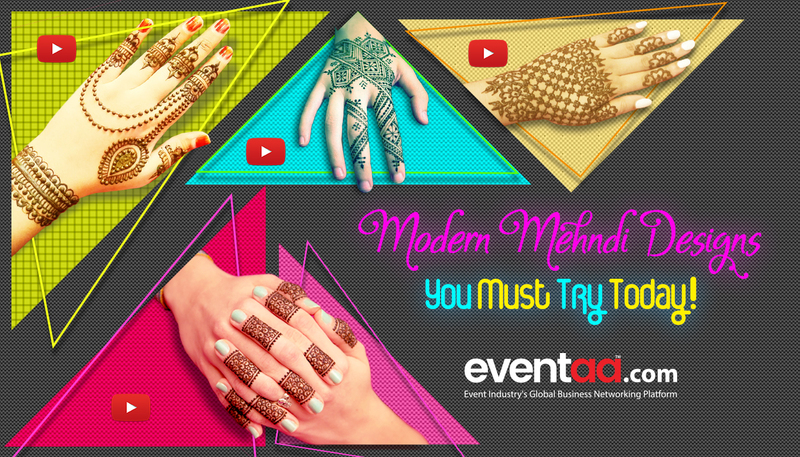 Blogs eventaa- Modern Mehndi Designs You Must Try Today! Home Blogs & Article Hindi Modern Mehndi Designs You Must Try Today! Modern Mehndi Designs You Must Try Today! Mehndi or Mehendi is a form of body art from Ancient India, and till date, it has not lost its importance. Mehndi is still a popular form of body art among the women of the Indian Subcontinent, Africa and the Middle East. There are many types of mehndi designs like Indian, Pakistani, Arabic, African, and Egyptian. Occasions are just an excuse for any women to put mehndi on their hands. Women have always been fascinated by different styles of mehndi designs. Here we have some unique designs of mehndi which every mehndi lover should try. Jewellery mehndi is the new trend developed among girls these days. It makes your hand elegant and attractive. Mostly this ornamental Mehendi designs applied at the back of your hand and the feet. These Jewellery or ornamental designs are versatile enough for any festive. The best thing is that you can go with this style of Mehandi on any day of the year. It provides a beautiful appearance to your fingers as well your hand. It’s a creative idea and easy to apply. If you have less time to put on mehndi, this is the best option for you. Just put a bright colour nail paint with this design, and you are ready to rock. The concept of Moroccan mehndi design originated from the middle-east; they have geometric figures in their mehndi style. This design involves small, and big types of squares, rectangles and triangles merged. Flowery patterns around the geometric figures make this design unique and different. The Glove Mehandi is a unique and modern style; It can be applied to the wrist and back of the hand. This style gives the illusion of wearing a glove. In this design, it uses regular petal-like patterns to create a lacy glove look. The colour of the mehndi can be black or brown, the length of the pattern can be till the arm or wrist or just fingers as well. Mehndi design is no longer limited to your hands and feet. If you want some adventure, you can make these designs on your back too. It goes better with the open back crisscross pattern blouse, Knotted back crop top, or with the backless top. Mehandi around naval is one of the bold and trendy style. Now a days teenage girls are fascinated by this because it is an alternative to the temporary tattoo. You can draw a flower or any round shape design. It will give you a stunning look with saree or crop-top. This design is, particularly for the lovebirds. It helps you express your love without even saying a single word, and it looks beautiful too. Rose, heart pattern, adjoining hearts, soul stringer, bracelet heart design, floral heart etc., these are some of the elements used in this style of mehndi. We hope above designs will help you to make your body more beautiful. Which Mehndi design did you like the most? Write your views in the comments below. Another interesting read: The Flower Trend Forecast for 2018! these are very beautiful mehndi design.please keep it up and upload new designs.